Scrub the mussels with a vegetable brush under running water; discard any with broken shells or that remain opened when tapped. In a large pot over medium heat, melt 2 tablespoons butter in the olive oil. Add the garlic, thyme, and lemon slices and cook until everything has softened, about 5 minutes. Add the mussels and stir to coat them with all the flavors. Add the wine, then the chicken broth; cover the pot and steam for 10 to 12 minutes until the mussels open. Remove the mussels from the pot. Take the meat out of 10 of the mussels and put them back into the pot along with the remaining butter. Using an immersion blender, buzz the liquid until the sauce thickens and becomes creamy; taste and adjust seasoning. 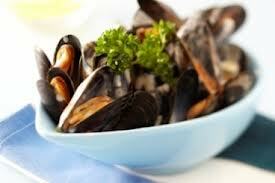 Divide the remaining mussels among the serving bowls and spoon over the sauce. Serve with plenty of crusty French bread to dip in the sauce. Google, you can be a pain Wanted: Your enchilada recipes!